There's an excellent primer on gold in today's Daily Telegraph. In case you haven't noticed, the price of gold (like oil) has been hitting record highs lately, a sure sign of 'turbulence ahead' if history is our guide. 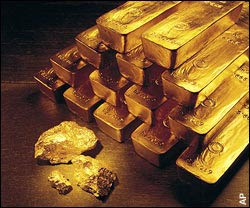 Control-freak politicians abhor gold because it ignores them; it won't do what it's told. It defies economists and laughs at central bankers. And if you are inclined to agree with Randall's perspective then you'll enjoy this deeper analysis by the insightful Sean Corrigan. I suspect that the financial market turbulence we are now experiencing is a precursor to a far more radical re-think about money. Though I don't expect a return to a gold standard, I do think it likely that we will move away from the fiat money system that we currently have. Former central banker Bernard Lietaer wrote a fascinating book a few years back on The Future of Money: and some of the ideas he set out in the book seem set to be a bigger part of all our futures. Indeed, we shouldn't be surprised if carbon plays a key part in defining what we mean by money. One of the most innovative ideas (developed in Ireland by Feasta) is that of Cap and Share. In effect, we may end up moving to a carbon standard rather than a gold standard. Still, in the meantime, it might do no harm to invest in the 'barbarous relic' yourself, if you haven't already done so. Can Capitalism Make Us Happy?